I've been a long-time fan of the Sookie Stackhouse series. I've been following the series for about six years now, and love it when May finally arrives, along with the latest Sookie book. So, I was really excited to read the latest and final installment. I have been saying for a long time that I thought Sookie would end up with Sam or another human. Read my predictions here, here, and here. I think that Sookie wants a family and that she wants to eventually distance herself from the vampire world. After seeing her sweet interactions and caring for her cousin and fellow telepath Hunter, I knew that there was no way Sookie would end up without kids. So, I was very invested in seeing how her love life concluded. I was happy with Harris' treatment of that part of the story. I have loved this series as a whole, especially the nuanced characters and detailed storyline, but the books have been hit and miss for me. I loved the last book, Deadlocked, but thought Dead Ever After was a low point for the series. The writing style was completely different from the previous books. 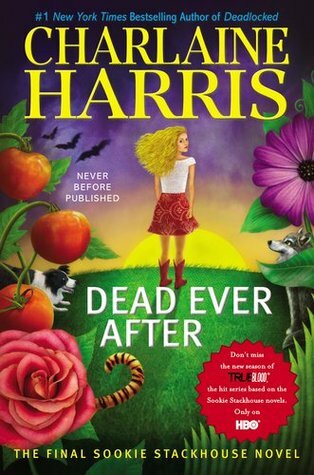 Instead of a sole first-person narrative, Dead Ever After jumps from Sookie's point of view to a third-person POV, mostly involving interactions with "the devil." I hate it when books jump around like that! There are demons in this series, yes, and I'm okay with that, but the inclusion of the real devil was out of the blue. And it did not feel true to the tone of the rest of the series. I enjoyed getting to read about each of my favorite characters from the series one last time. Just about every character shows up to help Sookie in her latest time of need (Sookie getting in trouble/death threats is a common plot device in this series). It was fun to watch everyone help Sookie out one last time. Overall, I liked this book but was disappointed: I thought Harris could have done a better job and at times I even thought to myself, "she's phoning it in here." The multiple POV's annoyed the hell out og me. I loved this series for NOT having multiple POV's, meh. I also felt they were unnecessary.